Well crud.. I have two more camp stories I plan on telling before the week closes, and a long needed contest update, but as per usual I've been distracted by other tasks. As an addendum to previous post, I must brag that Lindsay and I won a canoe race a few days later. The prize was a candy bar for each of us, which is one of the best rewards for physical effort I can think of. So I've been hanging out at this church a lot lately... Not getting religion, of course, but goodies at a rummage sale. I got a nifty little stamp set. From my super brilliant investigation of it I've determined that it was purchased in 1954 and used until 1959, because the years between those are heavily inked or missing, and years above and below them are unused looking. The type set into the thinger that holds the type (that I obviously don't know the name of but is probably something I could easily google but am too lazy to do although it would have taken less effort than typing all this stuff in these parenthesis in explanation) was "2nd Notice", so it probably belonged to somebody doing bill collection, which is sort of a downer. That's why I decided to give the stamp a better life and typeset. I couldn't find my stamp pad though, but was able to find my stamp pad inker, something that looks like a roll-on deodorant full of ink. 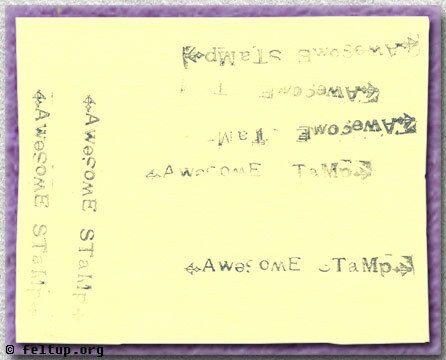 Then I took some tissue stuff and tried to make some sort of rigged stamp pad.. and that's my excuse for the stamp looking like crap. Frankly I'm disgusted that I'm even posting such a crappy stamping, but it's too late now cause I already put all this effort into it. I found out at 8:30 this morning, via phone call, that I will be meeting with human resources today at 3.